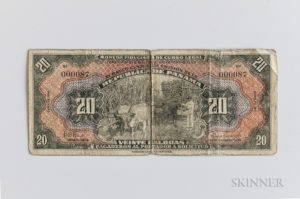 The First Paper Currency of Panama | Skinner Inc.
so much so that the 20 Balboa note is featured on the back cover of an issue of the Standard Catalog of World Paper Money. While this issue is relatively modern, its story is what makes any survivor a rarity of increasing value. In 1941, the then president, Dr. Arnulfo Arias, petitioned to enact Article 156 of the Panamanian constitution, authorizing the printing and issue of a national paper currency. 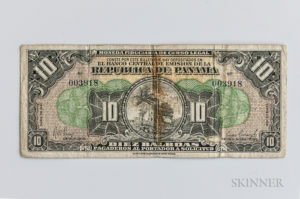 El Banco Central de Emision de la Repulica de Panama was founded and authorized to issue six million Balboas worth of notes, printed by the Hamilton Bank Note Company. Produced were four denominations, the 1, 5, 10, and 20 Balboa notes, and on October 2, 1941, 2.7 million balboas worth of these notes entered circulation. Seven days later, on October 9, while on a diplomatic trip to Cuba, Arias was deposed in a coup and replaced with an American backed leader, Ricardo Adolfo de la Guardia Arango. One of the first acts under this new president was to close the newly formed Banco Central de Emision, destroy the unissued notes, and exchange any issued notes over the proceeding ten years. With only a small handful of these notes escaping destruction and exchange, the remaining few garner much attention at auction, with the higher denominations only seen every few years. Skinner’s February coins and currency sale offers two such notes, a 20 and a 10 Balboa, the two rarest of the issue. These notes descended through the family of the original owner, tracing their roots to Panama back to 1902. An American engineer and his family relocated to Panama to begin life as the superintendent of a prominent gold mine. Shortly thereafter, another family member began work as a dredge master during the construction of the Panama Canal, where the family stayed until immigrating back to the United States in the 1980s. It was here in the Canal Zone, the designated area for the destruction of the “Arias Seven Day” issue, where the family acquired these notes. Skinner is pleased to offer such world rarities, lots 1559 and 1560, which open for bidding Thursday, February 8th and run through Friday, February 16th. This entry was posted in Blog and tagged Balboa, coin auction, coins, collectible coins, currency, panama currency, sell coins at auction by Kyle Johnson. Bookmark the permalink.